Nicole didn't know any of the brands she was wearing in this shot, which is, I have to say, kind of refreshing. Though after a moment or two, she did remember one of them. "Um, Rock Candy are the boots," she said. "I do know that." She shops mostly at stores like American Apparel and online shops including Nasty Gal and Dolls Kill. 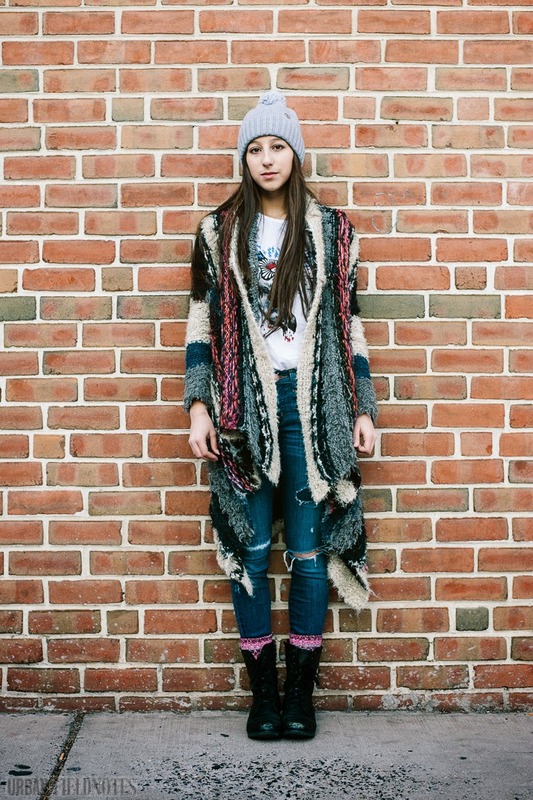 She describes her style as "edgy street fashion" but also likes "classic elements like faux furs." I had no idea faux furs were classic. 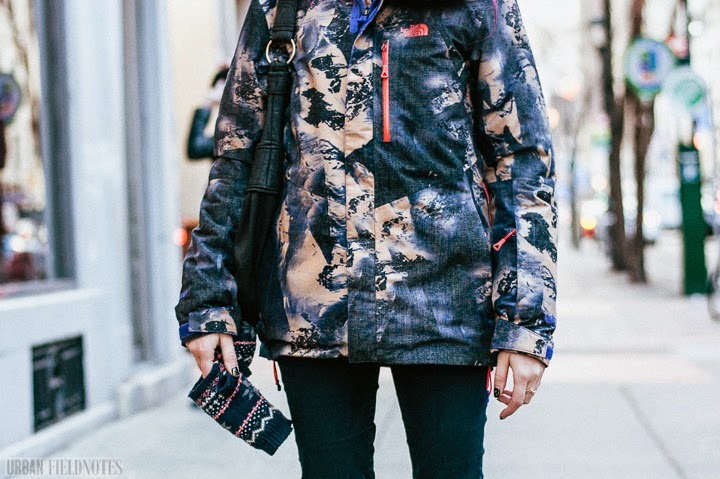 And she likes to layer. Leggings, for her, are a must. 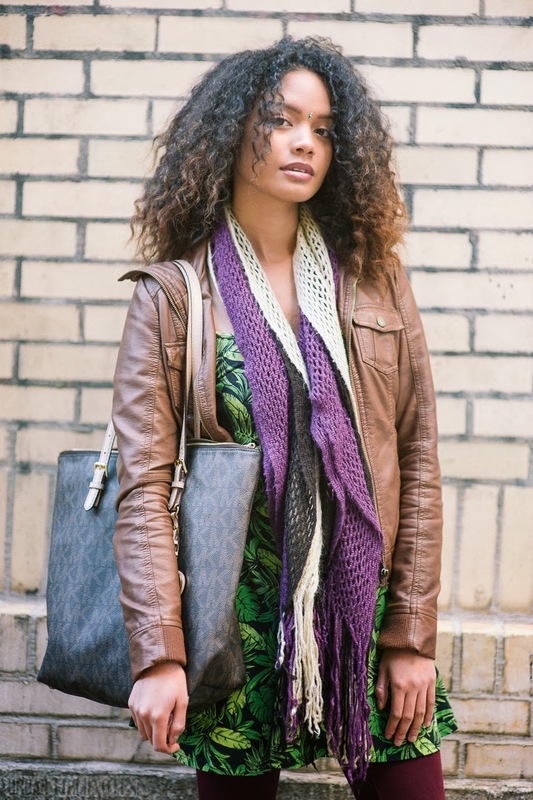 As for that scarf, she "knew [she] had to have it" when she saw it. "I'm really into Asian culture and Kabuki theater," she explained. 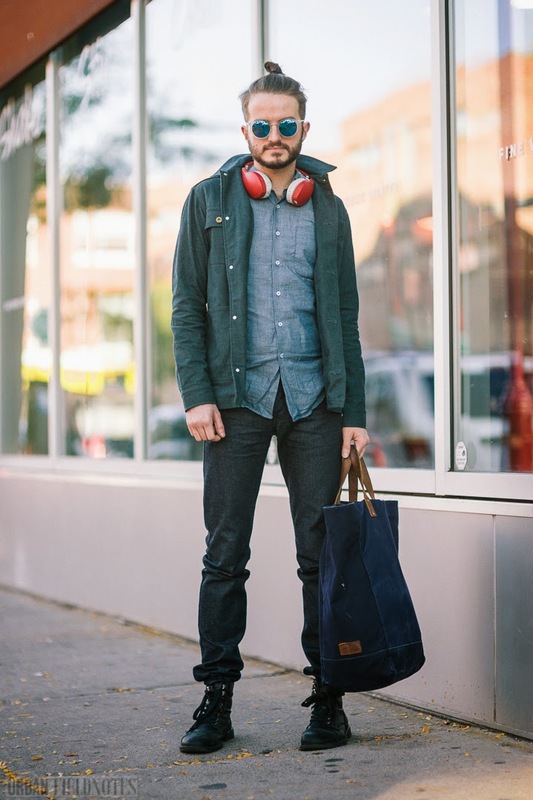 Sam describes his style as modern casual," and "business appropriate." He is dressed for work in these shots—as manager of a British pub—but this is how he dresses in his off-time as well. 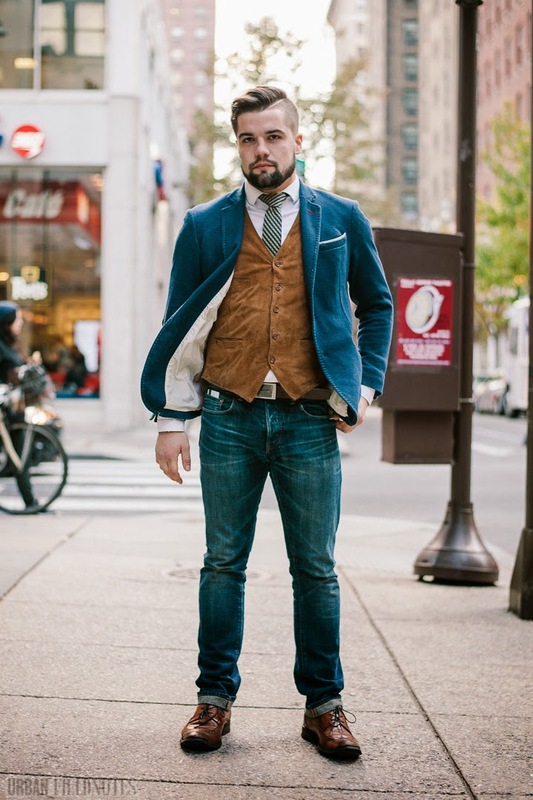 For the younger generation of urban American men, jackets and ties are no longer a burden to wear, a stale uniform of corporate life; they are a form of sartorial expression, worn, by choice and with pride—and in combination with casual wear and workwear, like these faded denim jeans. Here, Sam is wearing a Zara sportscoat, with an Allen Edmonds suede vest, a J. Crew shirt and tie, J. Crew jeans, and a Kenneth Cole belt. The brogues are Cole Haan. 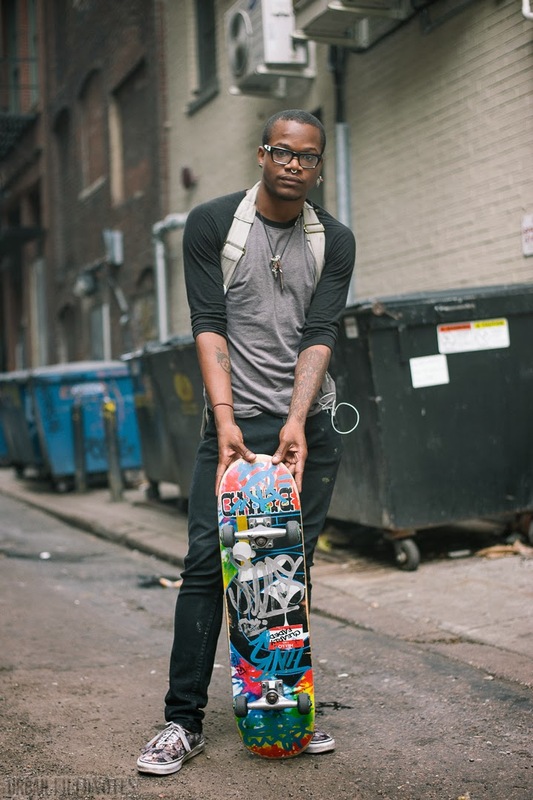 "There's so much diversity," Sam says of Philadelphia style, "that there's kind of all these hands in the pot, trying to stir things up a little bit. You never have one real trending fashion statement. It's really everybody does what they feel like." Sam typically feels like wearing a jacket and tie. "I just find things and put them on," Madison told me when I asked her about her sense of style. In these shots, she'd put on a Michael Kors beanie, a Free People Cardigan, a Mark Jacobs shirt, some jeans from Nordstrom ("I'm not sure the brand"), and some Free People socks. Julian is dressed head to toe in Theory, since that's where he works. 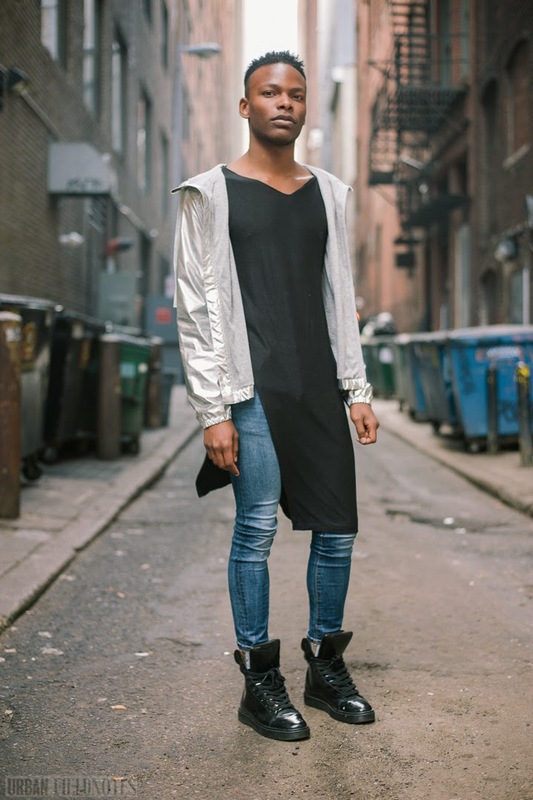 Search for street style subjects off Walnut Street, and you end up with a bunch of photos of retail employees. I stopped him as he was coming out of the drycleaners on Sansom. There is nothing showy or ostentatious about his look. It's classic, fitted black in the mode of an updated existentialist. And it makes me consider, for a moment at least, ridding my own wardrobe of color. It's winter in Philadelphia, cold, icy, and dry. Skin flakes off like paste on a kindergartener's desk. Fashion has been put temporarily on hold. 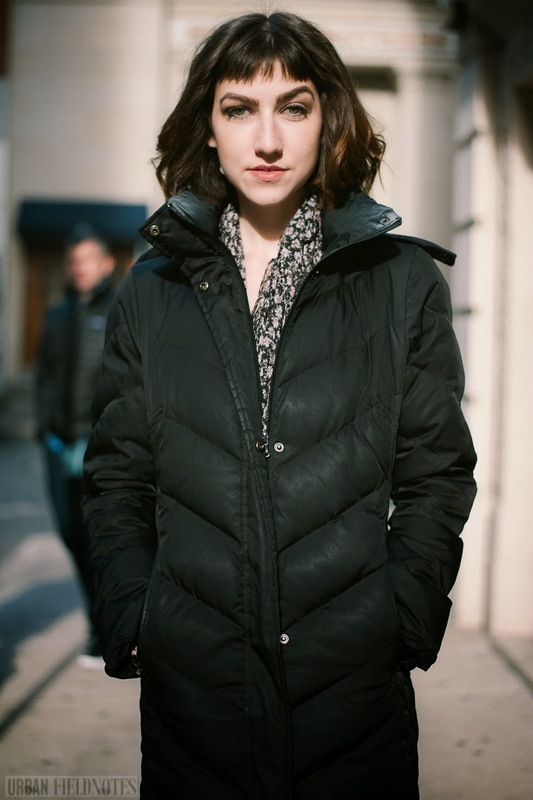 And so, stylish women like Emily are pulling out their puffy winter coats. "I think I got it from Macys," she told me of this one. "My mom got it for me for Christmas a few years ago. But it works for biking." That's the important thing for Emily; it has to be "bike friendly." "My shoes," Emily went on, I've had for a couple of years. I've danced the bottoms out and had them replaced twice. It's my roommate's scarf." Emily is wearing all black in these shots, she explained, because that's what she has to wear to work, but she wears black most of the time anyway. "I'd say that's the majority of my wardrobe," she told me. 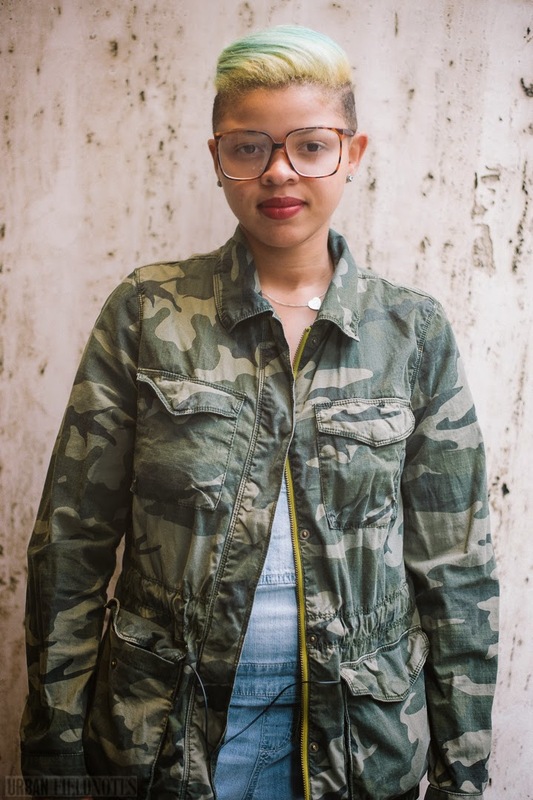 Her fashion philosophy: "keep it simple." 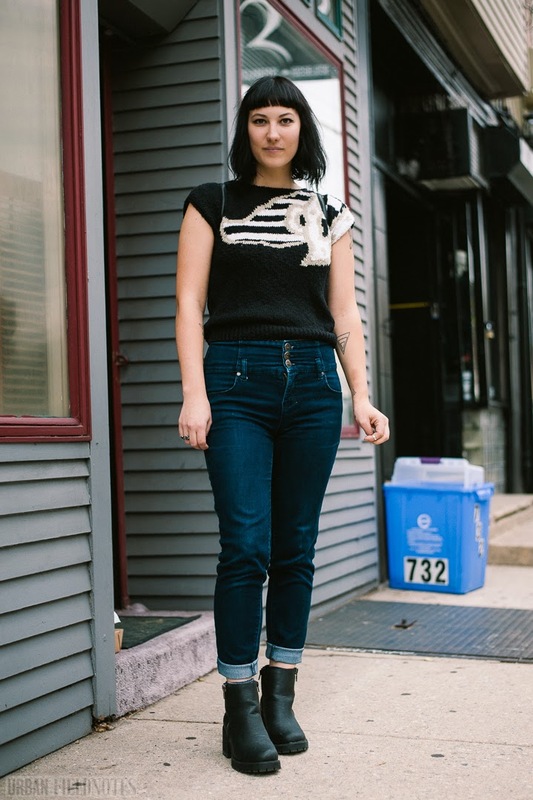 Emily characterizes Philly style as "definitely very unique." 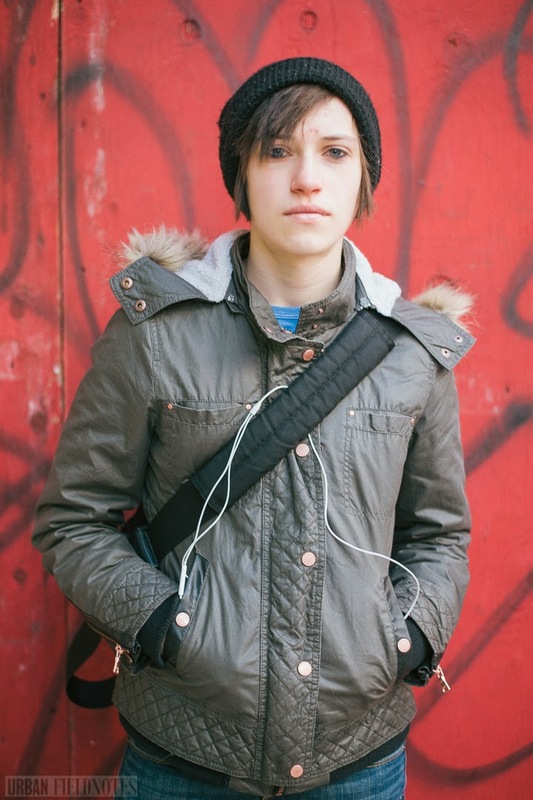 "A lot of grunge," she went on, and "everyone trying to create their own thing." 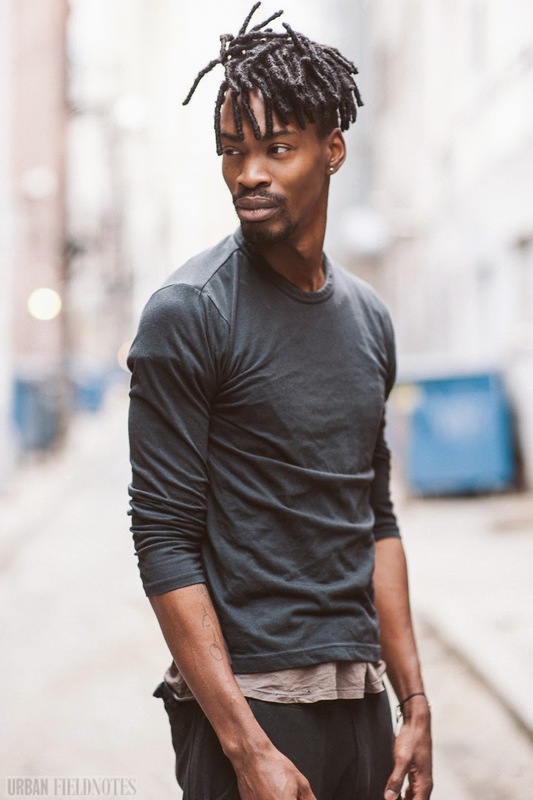 Deric is the designer behind Jeantrix, a local art and fashion brand that specializes in one-of-a-kind custom pieces. The motorcycle jacket he's wearing is one of his own creations. He's also wearing a a black hoodie (he's not sure where he got it), a pair of black skinny jeans from Hot Topic, and some Chuck Taylor black Converse All Stars. "I think they're best," he says, "when they're beat up." 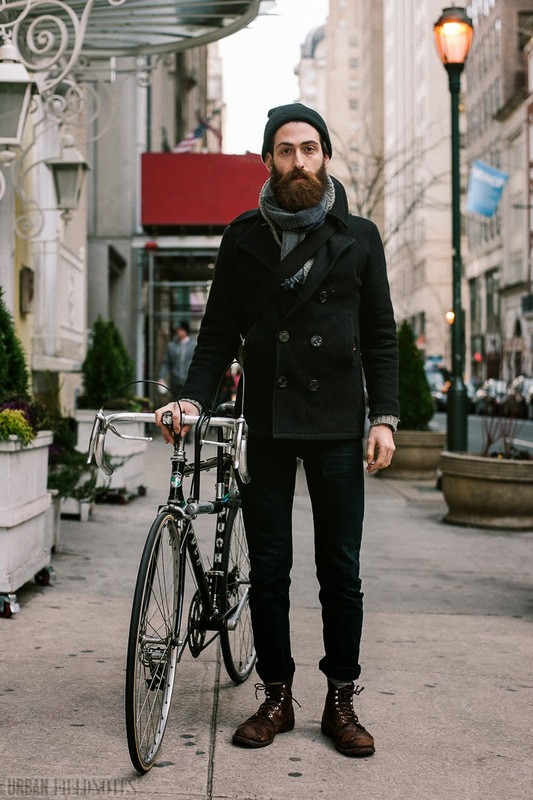 He describes his Chuck Taylors as his "comfort" and "go-to" shoes. "I have a lot of shoes," he explained, "but when I just want to get up, grab something basic, solid and go, I come straight to my Chuck Taylors. And I think they look right with almost everything." Jeantrix began as something of a hobby for Deric. He'd already been decorating his own shoes and jeans and it just grew from there. Now he and his brand are beginning to dabble in their own cuts and designs, in addition to customization. 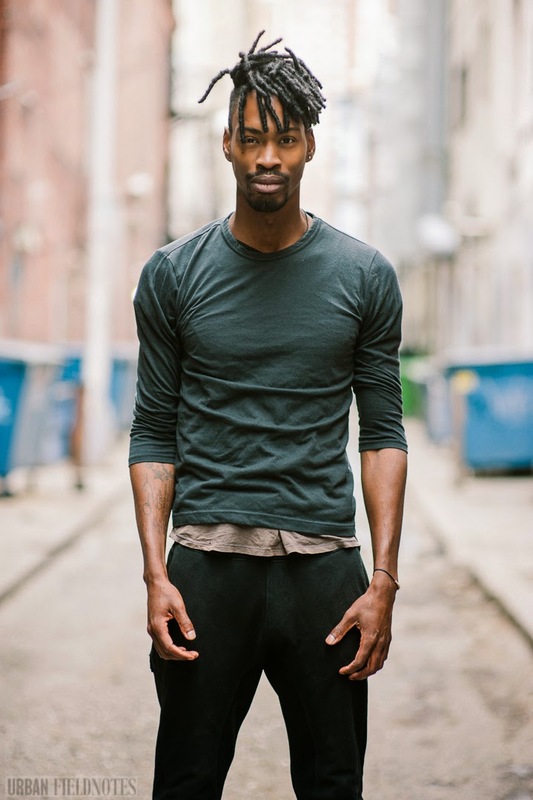 "I have faith in Philly style," Deric told me, "especially over the last year. I feel like it has grown a lot." "What do you think has happened over the last year to make that happen?" I asked. He thought about it for a moment and told me, "A lot more people are being more bold. I usually go to New York, and everybody is pretty much bold there. 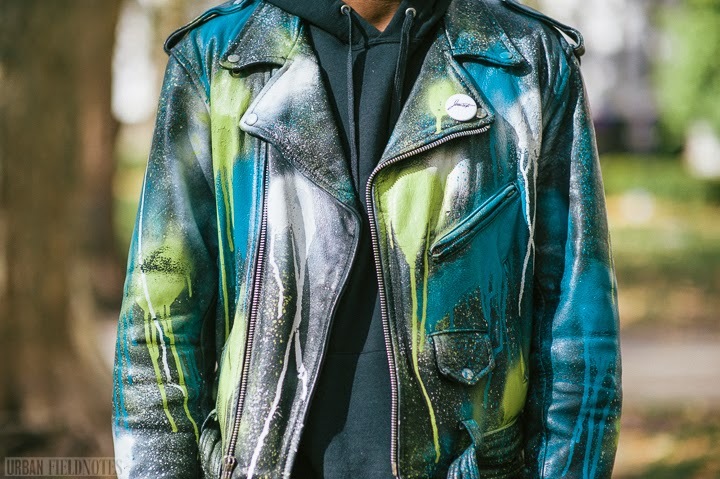 I think it just took a certain amount of people to just become bold and wear what they want, and other people come along and just, you know, hop on and do the same thing." 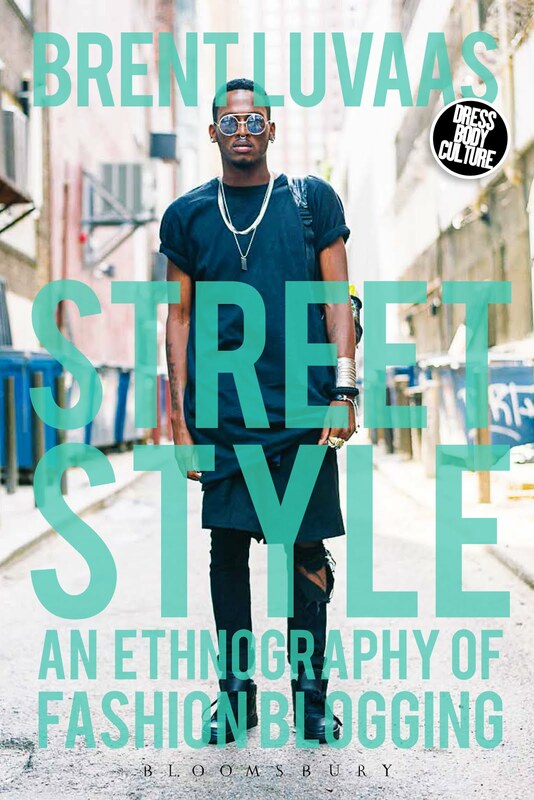 As for Deric's own style, he describes it quite simply: "Street." 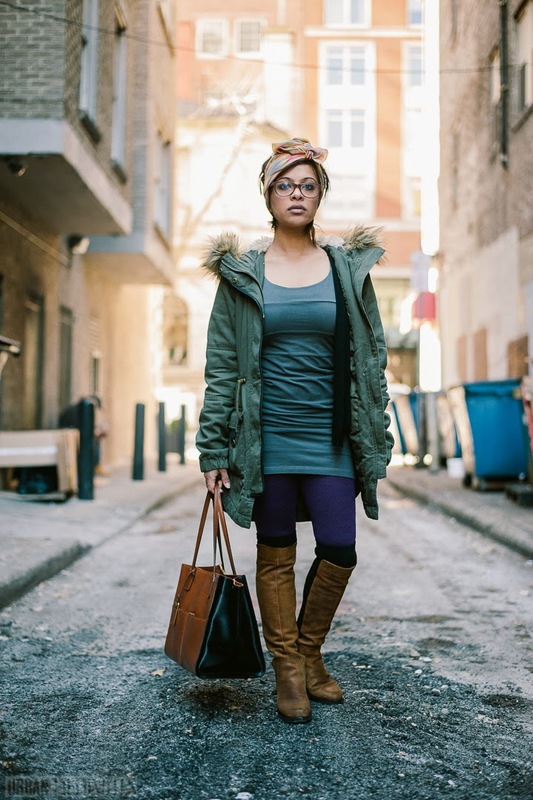 At the time of my shoot with her, Gurpreet, a long-time fashion blogger for Moda Ninja, had been living in Philadelphia for just over six weeks. She was still adjusting to the climate, but everything else, she said, was pretty easy to adapt to. "It's a beautiful city," she told me. "Everyone's so friendly. It's much better than New York." Plus, it sort of reminds her of her hometown of Pune, India. Pune, she explained, is about two hours outside of Mumbai, and people in Pune think about Mumbai almost exactly the same way Philadelphians think about New York. Mumbai is "like that city that doesn't sleep, and everybody is just moving around really fast." Pune, like Philly, is relatively laid back and calm. And it's a bit rougher around the edges than its larger metropolitan neighbor. Both Pune and Philadelphia define themselves in opposition to their big sister cities. Theirs is an identity defined in the negative. "So I feel very much at home now," she said. 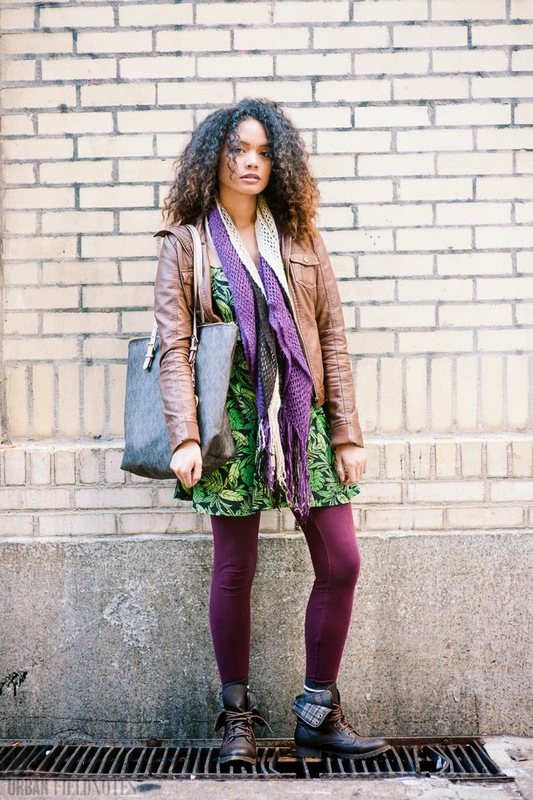 In these shots, Gurpreet is wearing over-the-knee boots from Aldo, a bag from Ralph Lauren, leggings from Macy's, a dress from H&M, an anorak from BCBGeneration, and a scarf from a thrift store in Pondicherry, India. "It's really easy to get a lot of thrifted stuff in India," she told me. The same is not true, however, for warm coats. She got hers here, along with the bag. Most of her accessories are from India. She just can't bring herself to buy them here, since she'll look at the tags and see "Made in India" on them. Better, she figures, to stock up on accessories during trips home and avoid the mark up here. She would prefer to buy local designers while in Philly. In regards to her own style, Gurpeet says, "I'm not a diva. I'm a fan of quirk and whimsy. I dress up with an attitude of 'I can,' which sometimes is reflected in my choice of accessories and hair color. I embraced my defective eyes, and hence was happy to wear my large prescription glasses everywhere, [even] before 'nerd' was a trend. I'm inspired by vintage and retro themes." Gurpreet's blog Moda Ninja, champions various Indian designers and brands. "The fashion scene in India is booming," she said, "and there are so many designers to love and like. 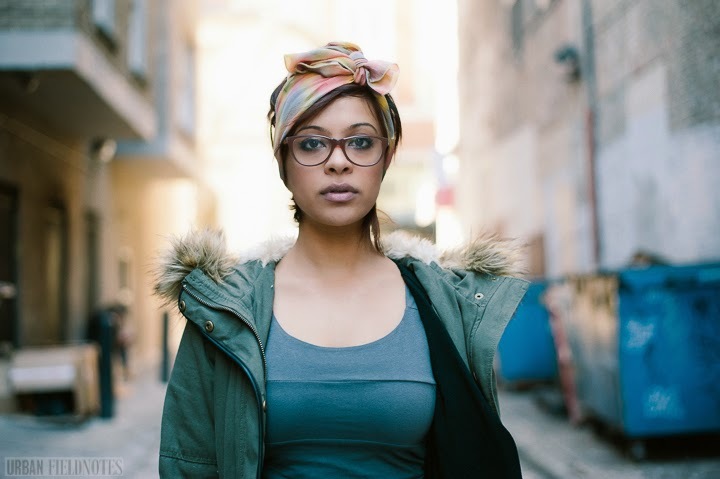 I prefer investing in accessories than in outfits, so naturally I'm a fan of accessory designers like Eina Aluwalia. Her designs are contemporary yet have a classic feel. Mrinalini Chandra is a newbie with very quirky designs—[she] uses fish, flowers, and chairs in her jewelry! When it comes to apparel, no one compares to Sabyaschi and Manish Malhotra, who are like the Karl Lagerfeld and Tom Fords of traditional Indian design." 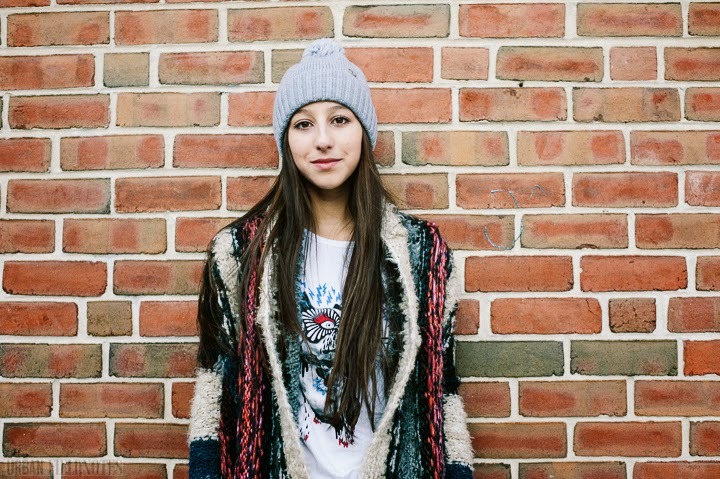 Ana, like most people, has no idea how to describe her style. 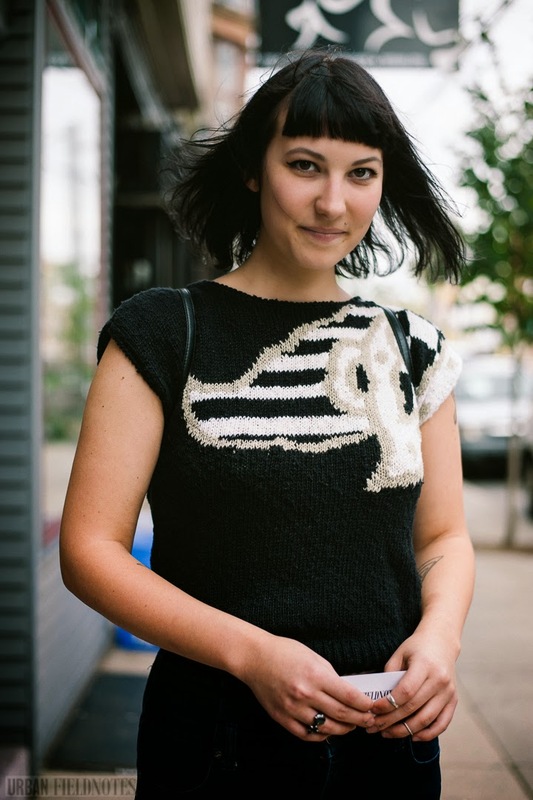 She has other things on her mind, like getting through her day without being harassed by a street style photographer. "I guess kinda trendy," she says, "but more functional right now. I'm just trying to keep warm." And she is doing so in a North Face coat, a pair of North Face boots, and a Burton hat. She could be on the ski slopes in this outfit. But she's not. She's braving the frigid streets of Center City, Philadelphia instead. Braden likes to "go with a little bit more of a funky look. A little bit of an edgy look with a little rock 'n roll twist to it, kinda like a bad attitude type of deal, but kinda mellow." He works at Diesel, and a lot of his clothes come from there, including his shoes, jeans, belt, and watch. The leather jacket, however, is H&M. Of course it is. He lives in Philly. Everyone here has at least one item from H&M on them at all times. The top, which you can't see, is Forever 21's heritage line for men. "In college," Na'eem recounted,"there was one time I had to prepare for a test, and I didn't prepare for the test, and I saw a friend of mine as I walked into class, and she says, 'Ah, Na'eem, you look really nice today.' And I said, 'Yeah. I'm gonna fail this test, so I might as well look good while I'm doing it." That, in essence, is Na'eem's fashion philosophy: do it in style. 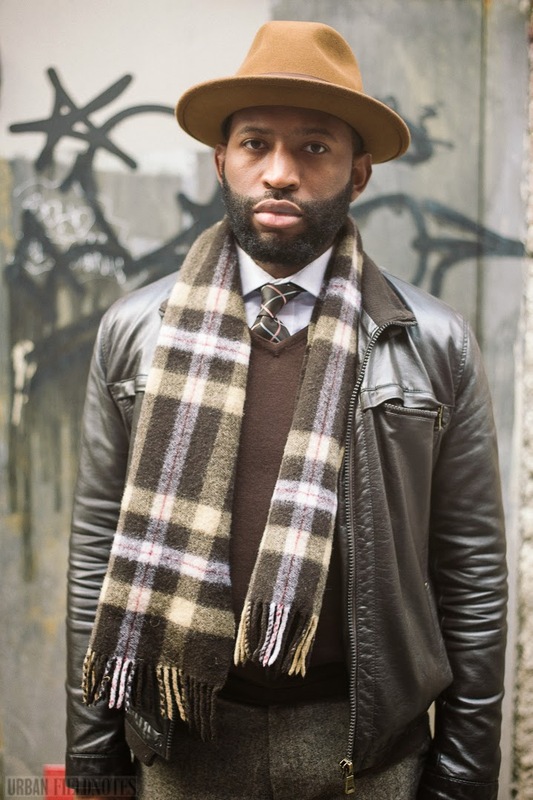 "I like to wear ties," he said, "and I think there's something cool about looking nice." 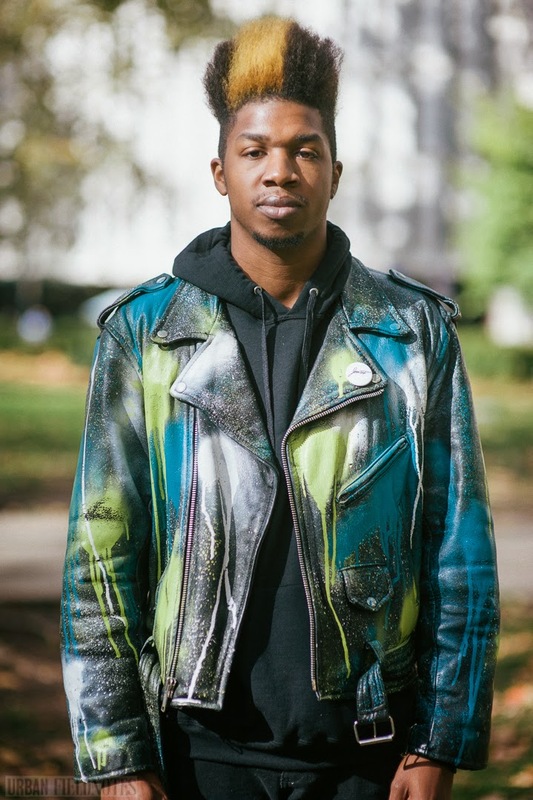 Na'eem is a journalist, former Philadelphia news personality, and the blogger behind The Brookladelphian. I shot these images in the midst of his shooting a feature for his blog on me. 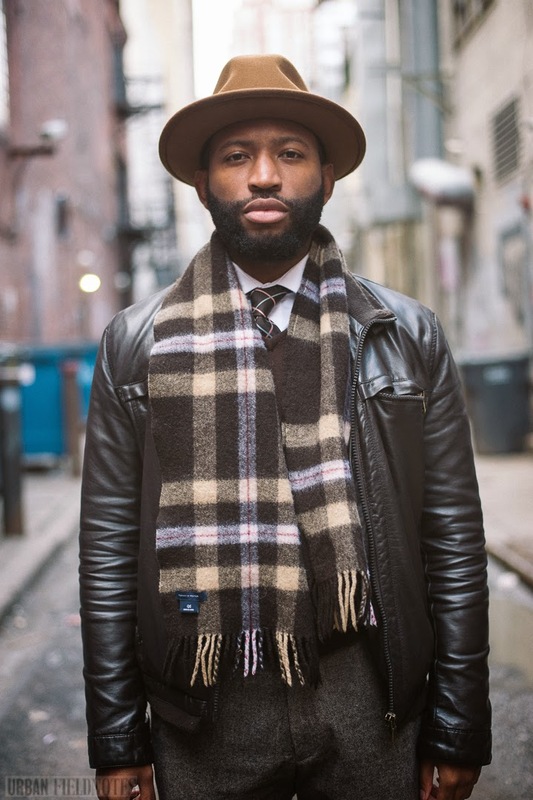 In these shots he's wearing a Tommy Hilfiger scarf, an H&M jacket, Allen Edmonds wingtips, and a Goorin Bros hat. Goorin Bros, in fact, is how he found out about me. He saw my photos printed up in their shop on Walnut Street, "and that's when I said I gotta do something." He has no idea where he got those pants. 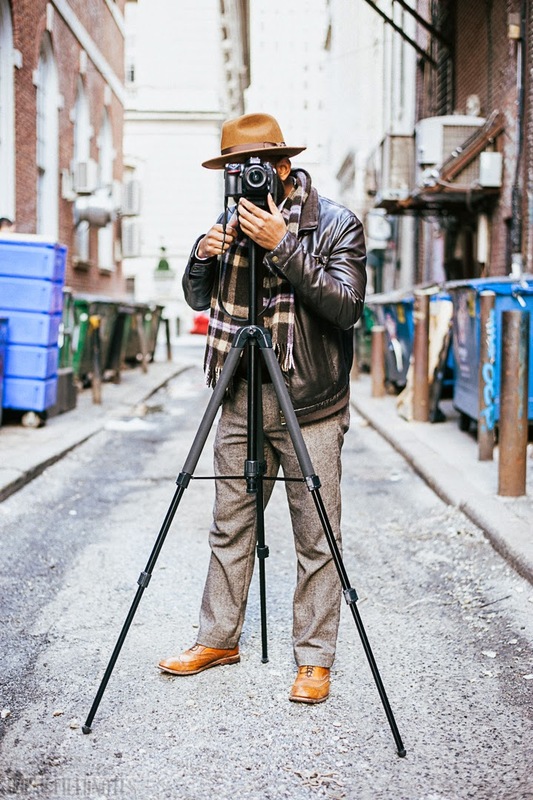 Na'eem's project with The Brookladelphian is to establish links, both stylistically and historically, between the two cities.He describes Philadelphia's style, much like Brooklyn's, as having "a little bit of an edge to it." "It's infused," he told me, "with hip hop. It's infused with a little bit of preppiness.I mean, if you think back to what Philly is, you think of Boyz II Men. And you think of them wearing the vest together with the bow tie and whatnot. At least I do. Maybe some younger person doesn't." Na'eem has been wearing bow ties himself since he was a kid. He credits that to his mother. "There are pictures of me as a kid in a bow tie and shirt and decked out, and I was gonna go out and play with the kids. I just enjoy looking nice. So why not?" And then, of course, there's the matter of the beards. 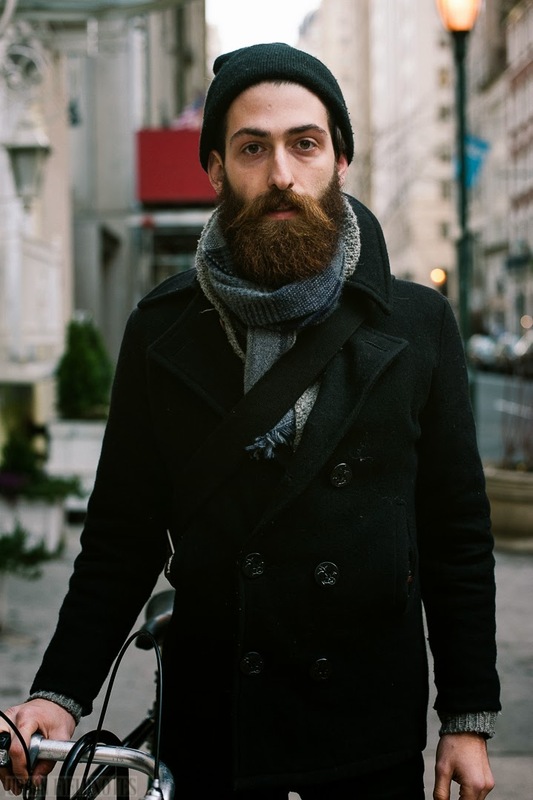 Philly beards. Back in Brooklyn, "I had a bartender I was talking to, and he comes over, and he had the big beard, and I say, 'Hey man, are you from Philly?' and he says, 'If I had a dollar every time people asked me that!' He said, 'I started growing this beard a month ago, and now everyone asks me if I'm from Philly. And then he said he looked it up and [found out] there's an actual [thing called a] Philly beard." Na'eem's own beard hasn't quite made it to that length yet. "My beard, you know, it's not so much a Philly beard. It's not quite there yet. But [when people ask me about it, I say] 'Yes, it's a Philly beard, and everyone else that has it is copying off of Philly!" Monique described her style to me as "casual" and "witchy." 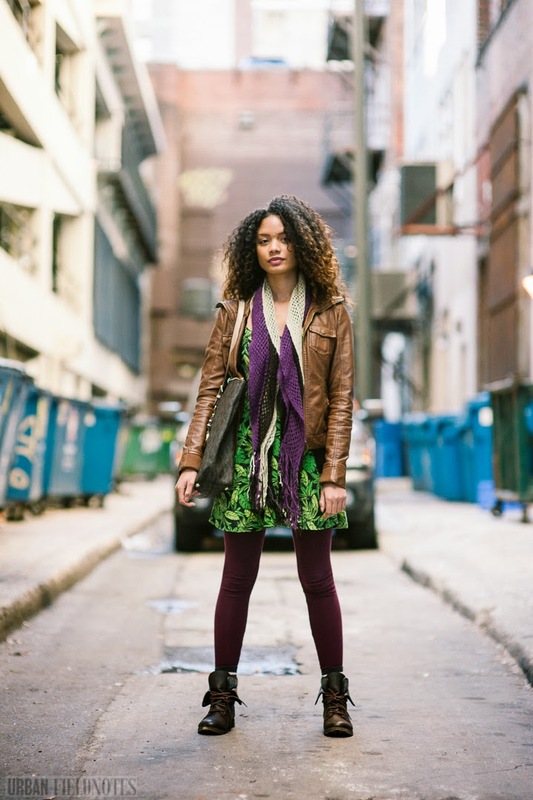 She wears mostly black and shops mostly at thrift stores, including Philly AIDS Thrift and Moon and Arrow, where she works. Everything she's wearing in this outfit she bought second-hand, though she uses the term "vintage" instead. It's a fine distinction. We apply it to used clothing and other objects to which we attach cultural cachet. Second-hand is clothing picked through in the bargain bin. Vintage is clothing "curated" by a boutique. There's a simple formula you can use to tell the difference: Second-hand + prestige and/or nostalgia = vintage. David's style, he explained,"is very metro meets classic. It's English, a little bit French, and it's a lot of Philadelphia." "What is Philadelphia to you, in terms of style?" I asked, following up on his statement. "It's an old town. It's where families first came to America and settled. It's where they still are. This is home, not work. So people are here kind of because they get classic America. And they love to have their hands on everything. So it's very relaxed meets sophistication." 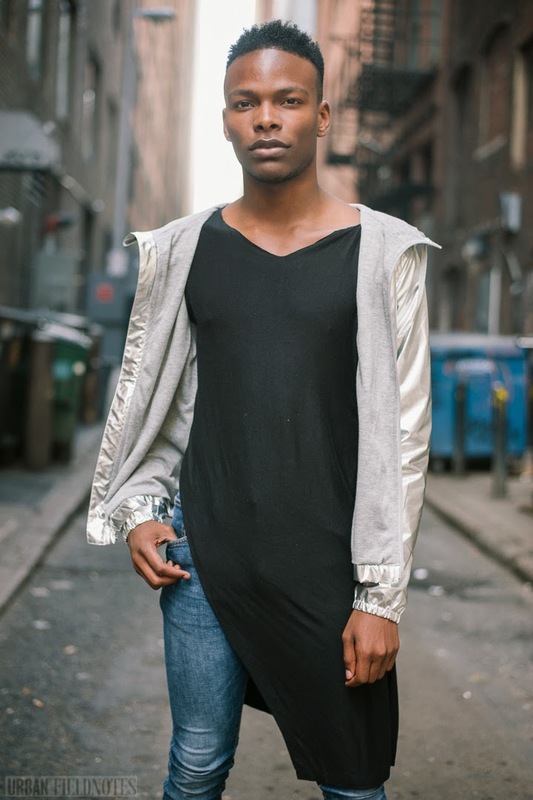 In these shots, David is wearing a jacket by Kemitch. The coat is bespoke. The minks are from Jacques Ferber. The shoes are Hugo Boss and the bag Kenneth Cole. Both are made from crocodile skin. He couldn't remember the brand of his pants at the time but Facebooked me later to let me know they were Banana Republic. "Sorry to hold you up," I said to the woman David was with. "No problem," she told me. "This happens all the time." 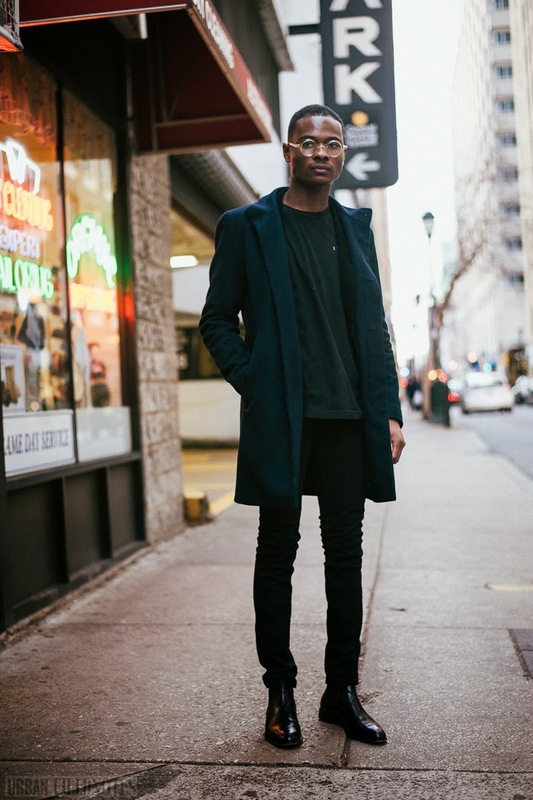 Alex knows a little about street style himself, writing street style features for Philadelphia Magazine along with Emily Goulet. 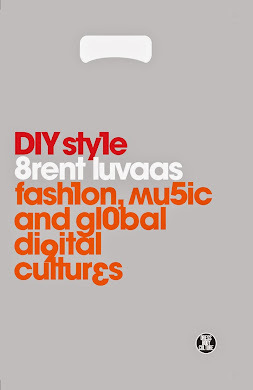 I first met him on the way to a party for the local fashion label NINObrand last summer. We shot these images after I finished doing a shoot with Ps and Qs shop on South Street that he helped orchestrate. As for his own style, Alex has done a fair amount of thinking about it as well. This is what he had to say: "My sense of style is simple, to be honest. It's clean. My philosophy is that it's not so much about trends. It's really about finding what works for you and repeating it. Or just finding what makes you feel comfortable. I'm not saying, like, sweatpants. Just your kind of aesthetic. And then doing that." 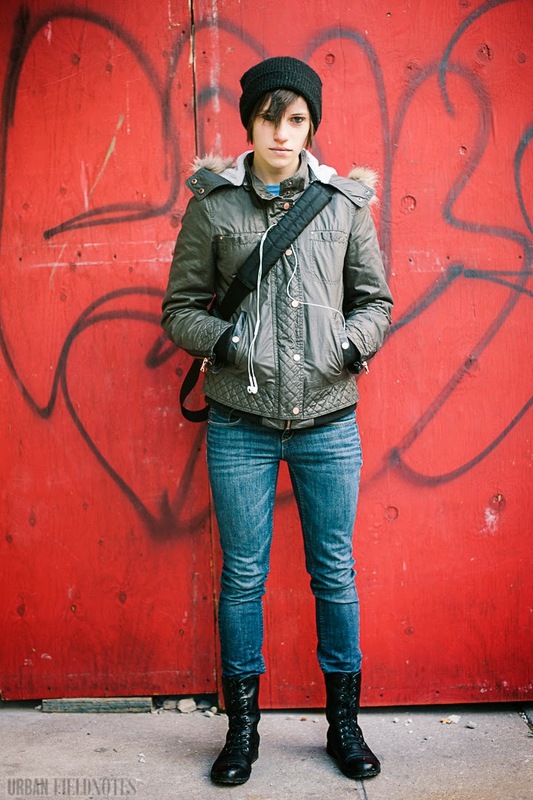 "Black skinny jeans," he explained, "will always be my go-to. And maybe that's not in this season. That's kind of classic in general. But I really just think that people need to figure out what works for them and do it. And have a really strong sense of self in that representation. Like, I love book bags, and I don't think book bags are necessarily always revered as the most stylish things. At times I have trouble dressing up. I wear a lot of casual. Like in summer, I wear shorts all the time, regardless of them being trendy. And that's just who I am." 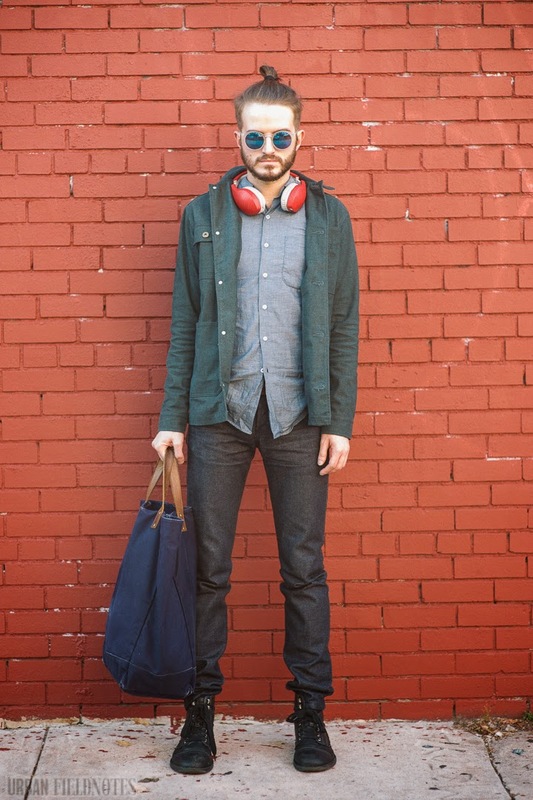 In these images, Alex is wearing Velodyne headphones, a jacket by Publish, a chambray shirt by Naked and Famous, Mint scratch 'n sniff raw denim jeans also by Naked and Famous, shoes from Target, sunglasses "from a little vintage shop in LA," and, of course, a book bag from United by Blue. 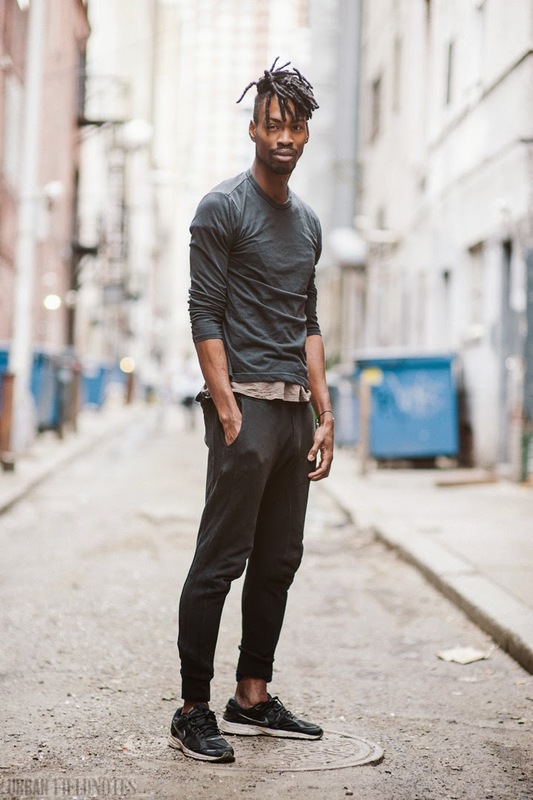 "I think the Philly style scene is one that gets a lot of slack from people on the inside and the outside," he told me. 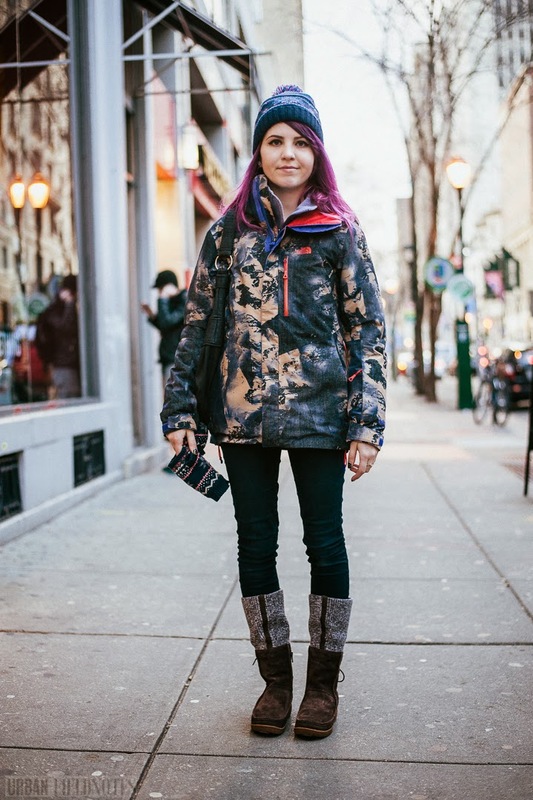 "I definitely think in general Philadelphia is a comfortable place. We're cheaper than New York. And that's what so great about this place, that we have this freeness and comfortableness to just be ourselves that I think at times kind of resonates in fashion with us being lazy. 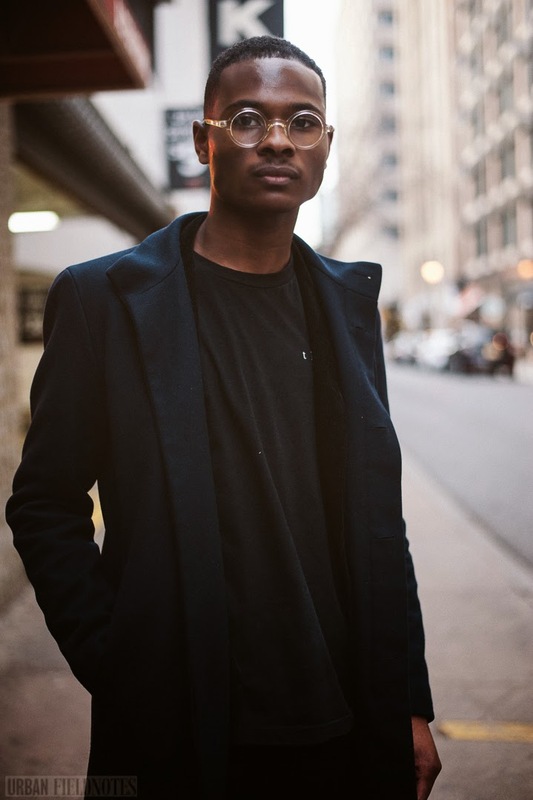 But I think that people that do fashion well in this city do it really well, and those people are heightening our city over all." Kia does most of her shopping online, without a lot of brand allegiance. She finds stuff wherever she can. She pieces together. She mixes and matches. If she had to pick a single brand that seems to capture her own sense of style best, it would be Urban Outfitters, she says. "That's basically the main place that fits my style." And just what is that style? "I can do any type of style," she said. "I'm versatile. So just," she searched for the words, "urban chic." 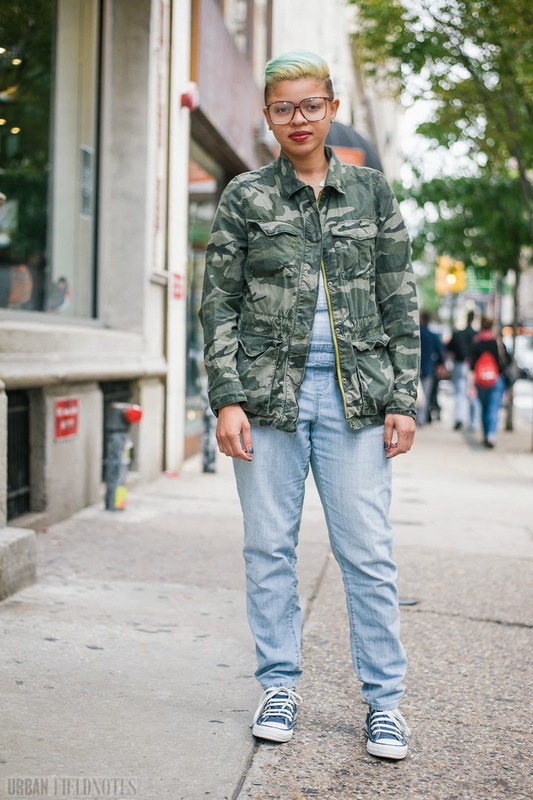 In these pictures she's wearing a jumper from Macy's, where she works, an army fatigue jacket from the Gap, some blue Converse, and "yeah, that's just about it." Joseph, like me, is a California transplant. 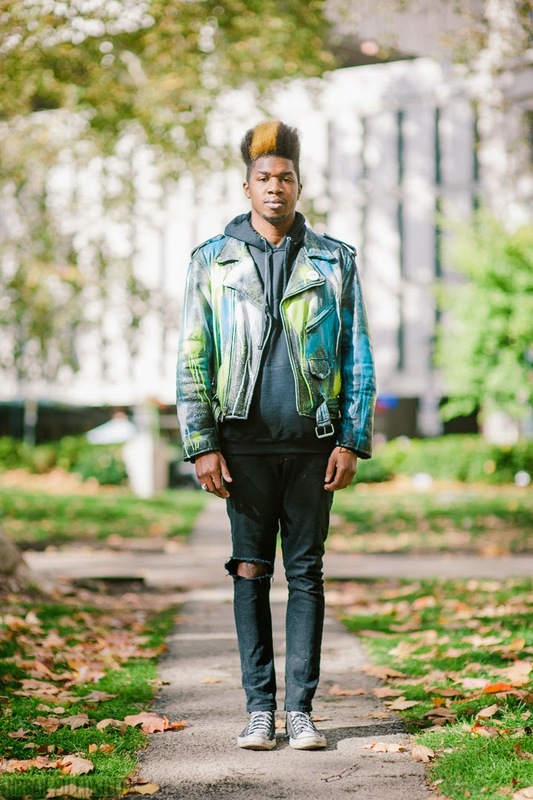 He's been living in Philly for about four years now and described the style scene here as "ever-changing. You see something one day; you see something else a different day." His own style he referred to as "alternative, but not too much emo." "What's wrong with emo?" I asked. "Nothing," he replied. "But just that was my high school phase. I like wearing black, though, so I'm just gonna stick to it." 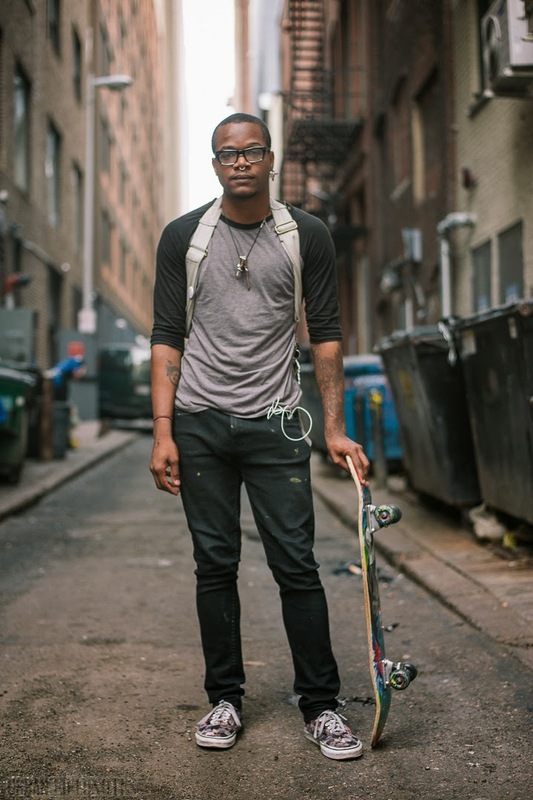 In these pictures he's wearing a baseball shirt, "real skinny jeans" spattered with mustard,"some cat ASPCA limited-edition Vans. And some piercings." He's not really a memorize-the-brand-names-you-got-on sorta person. Except, of course, for the Vans. 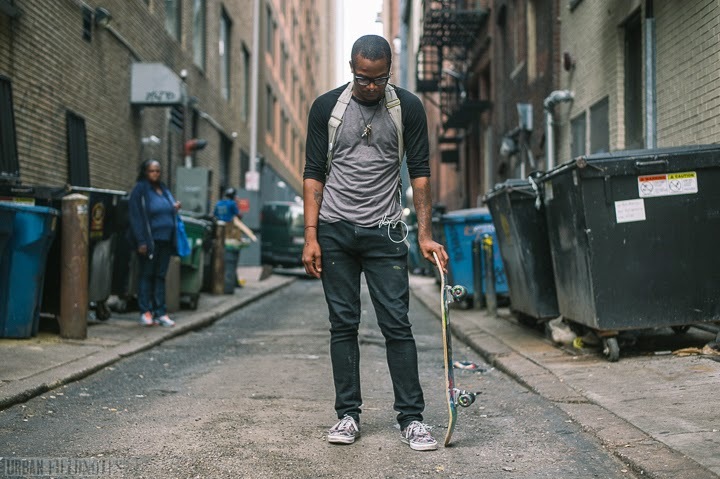 He is, after all, a skateboarder, and Vans are a staple of the skateboarding scene. Every thing else is more about ease of wearing. Basic black. Casual. Comfortable. iPhone tucked away in a pocket. 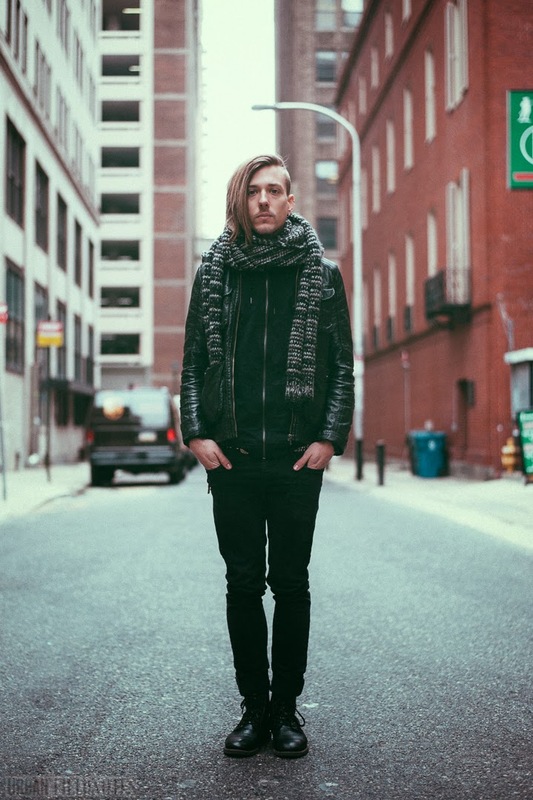 Guido recently moved to Philadelphia from Brooklyn, as one of his bandmates from their group Ghost & Sparrow lives here. He needed somewhere to hang for a while before he starts grad school at the London School of Economics next year. "It's an incredibly beautiful city," he said of his new, albeit temporary home. "Really good coffee. Really good beer. Those are sort of like your life checklist. If you have those, you're good." "And," he added, "it's extraordinarily affordable." "For as small a city as it is, Guido went on to say, "it's got a very sharp sense of fashion. Like, I remember when I used to come here a lot, like a year or two ago, and we would see some of the best-tailored suits I've ever seen in my entire life here." As for Guido's own sense of style, "I like to draw upon things made in the USA," he told me, "sort of like an Americana work-weary look. Recently, I've been pushing it towards more darker styles, sort of like Raf Simons, or someone like that." In this shot he's wearing some jeans from Rag & Bone, Redwing Iron Ranger boots, a Topman cardigan, and a "women's navy issue peacoat." "They don't really make them for my size," he explained. 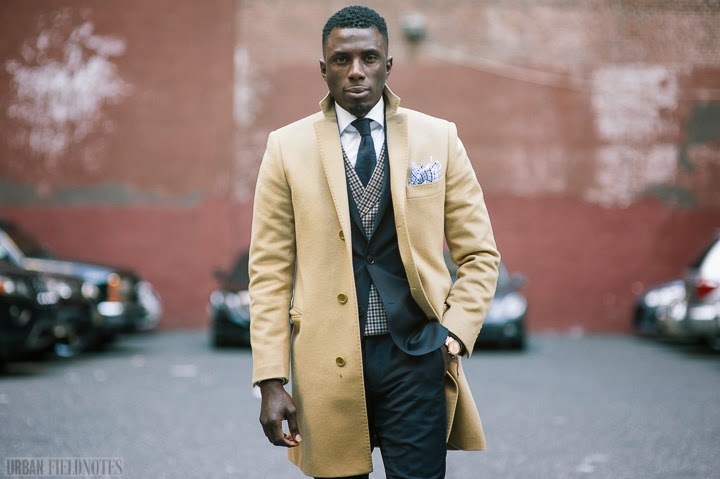 Akief approaches menswear with the meticulousness of a craftsman. Everything has to be fit together just so. There are rules to follow, right ways to do things and wrong ways to do things, and other, more complicated and nuanced rules for the advanced practitioner. You have to "work your way up" to those, your charcoals and your pinstripes, your pocket square folding techniques. 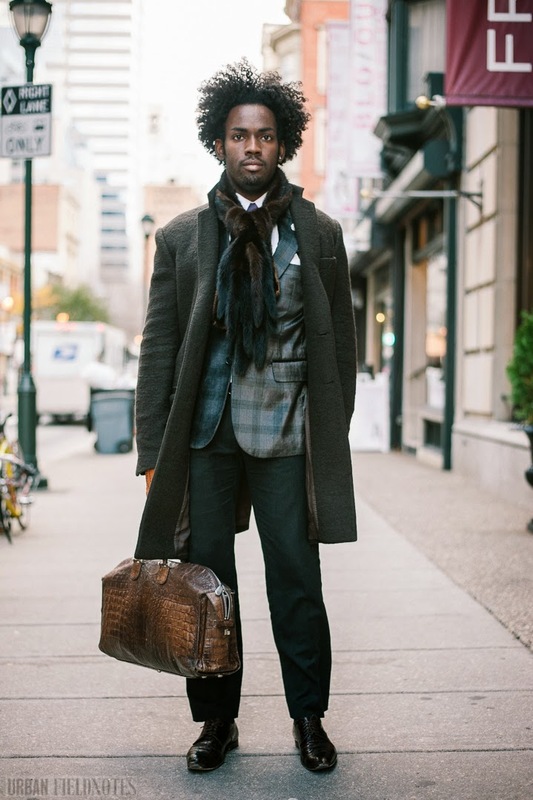 Better to start with the basics: a navy blue suit, in this case the Red Label from Saks Fifth Avenue, where he works, a camel overcoat, also from Saks Fifth Avenue (special ordered), because "you have to have that color, man," and a pair of light-brown leather shoes from To Boot New York, "probably one of the best shoe brands in America today." 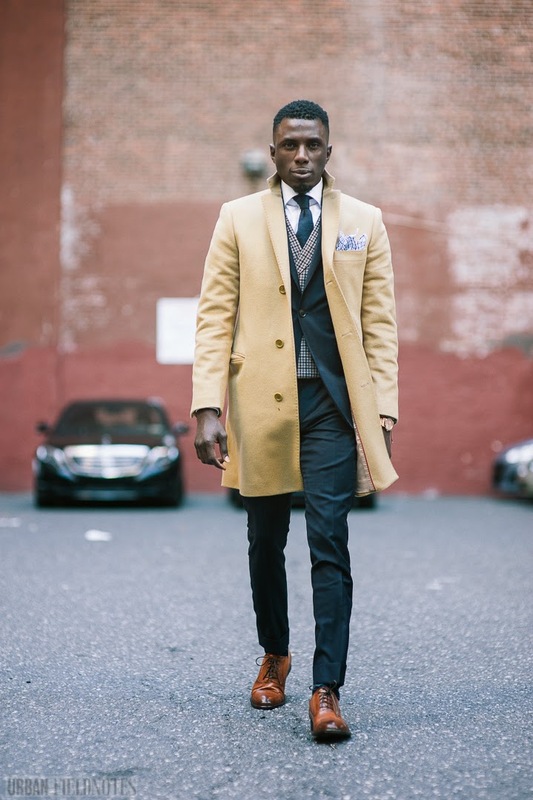 Born in Liberia and raised internationally, with the last decade or so spent largely in North Philadelphia, Akief is something of a menswear traditionalist. He learned many of the rules from his father. Others he picked up along the way. His pants, for instance, are "eight inches from the thigh up" then six and a half inches "coming up to [his] calf muscle." They are double-cuffed, because "double cuff is coming back, and it's something [he] saw [his] dad wearing back in the '80s." And they have to be exactly two inches. "You can't do one and a half," he said. "That's not right. They have to be nice and thick." 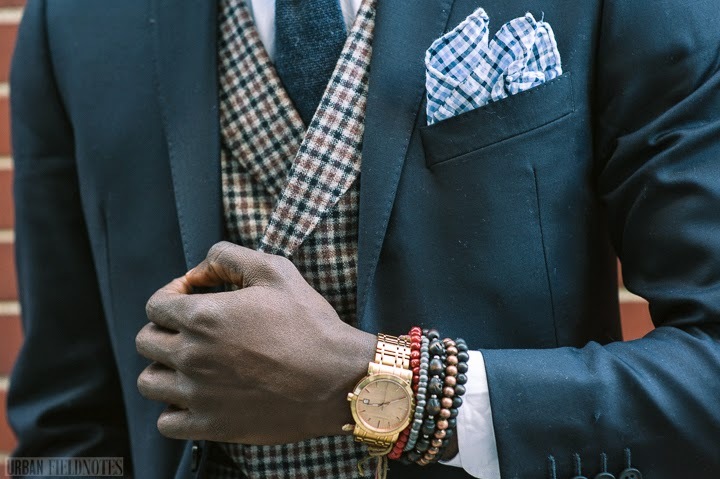 Menswear may be a largely prescriptive endeavor, but there are places for adding a personal touch, mainly in the accessories. 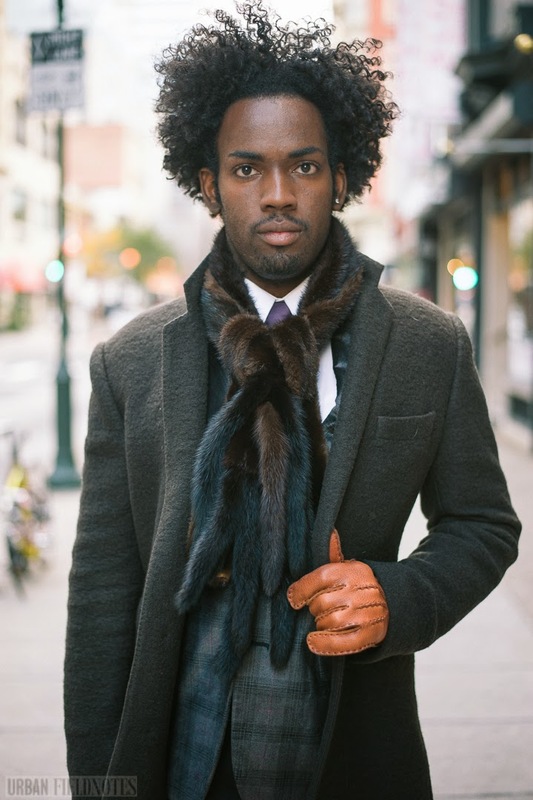 "The vest," Akief explained, "is a double-breasted vest by SuitSupply. It was in the spring collection last year, and it's a navy, cream check. And I was thinking about doing, like, something underneath this dark navy suit. I want to bring out the suit, like emphasize it. 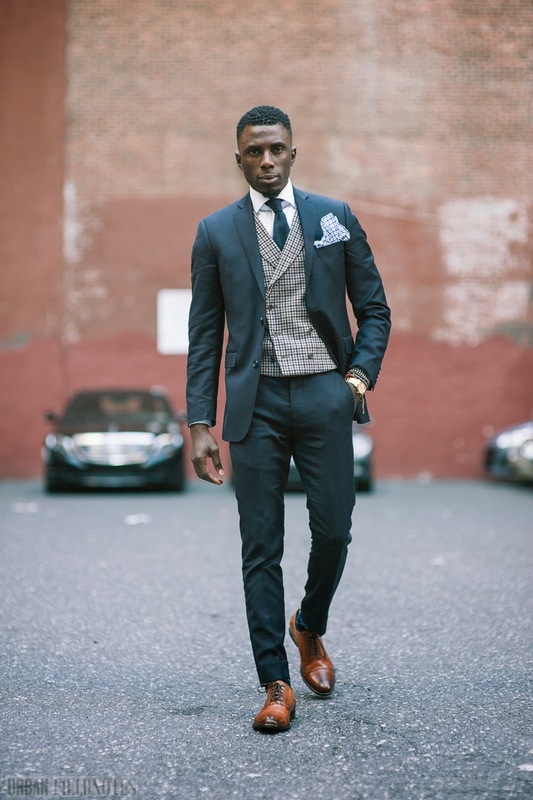 Why not go with the navy check, double-breasted vest by SuitSupply? You know what I mean? 'Cause that would just bring that." The socks, the tie, and the pocket square are all by Hugo Boss. 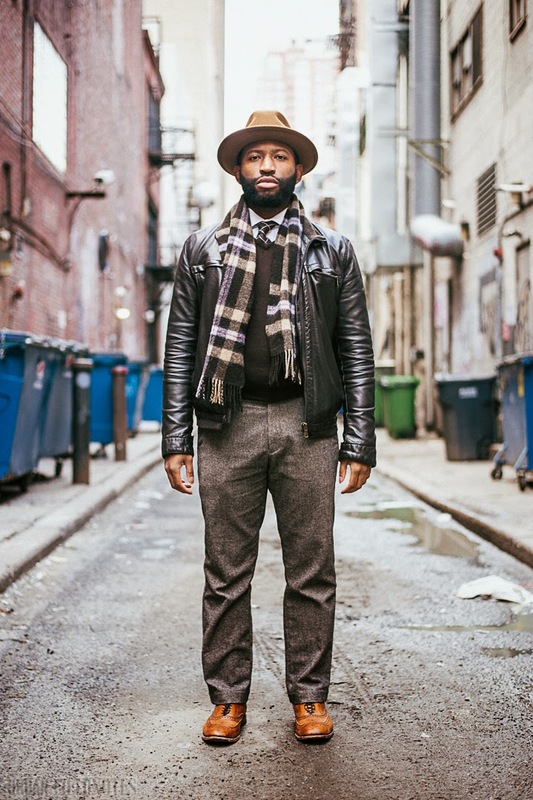 Here's what Akief had to say about his socks: "Your socks have nothing to do with your outfit. I mean, your socks is your whole personal style. It's your statement. Whatever statement you wanna make or whatever you want to do. You can express yourself through your socks. It's about socks expression." He dismisses the common idea that one's socks should match their tie. That's why he's wearing a dark, solid-colored knit tie, tied with an Amsterdam knot. "There's not a lot of guys who know how to do this," he said of the knot. He learned the knot himself from watching YouTube videos. "I tell people YouTube is the best university in the world." He had to watch the video some ten times over a couple of days just to get it right. His watch is Burberry, and it's rose gold. "This is my everyday watch," he said. "This watch, this color, the rose gold, goes with anything, see what I'm saying. So this is like something that you're going to see me wearing everyday, even though I have other watches and stuff like that. I mean, it's nice. It's comfortable. I can go to sleep with this watch, wake up in the morning, wear my clothes, and I'm out, know what I'm saying. And I feel weird when it's not on my hand, 'cause I know something's missing." He's embellished his watch with accessory beads from H&M. "I love mixing highs and low together," he told me. The beads cost five bucks, the watch, well, a bit more. 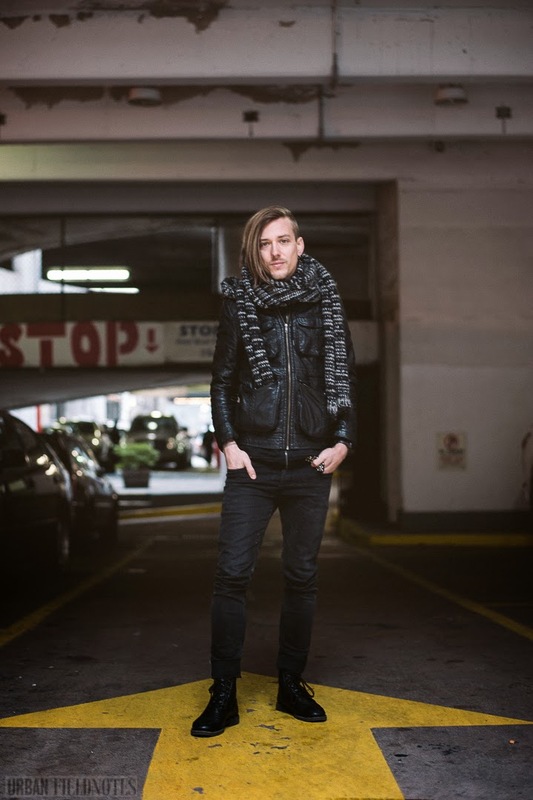 "Even though I work for a high fashion company," he said, "I still go to H&M to look around." For Akief menswear is not just a passion, not just a means of self-expression (or is it self-discipline? ), it's a career in formation. 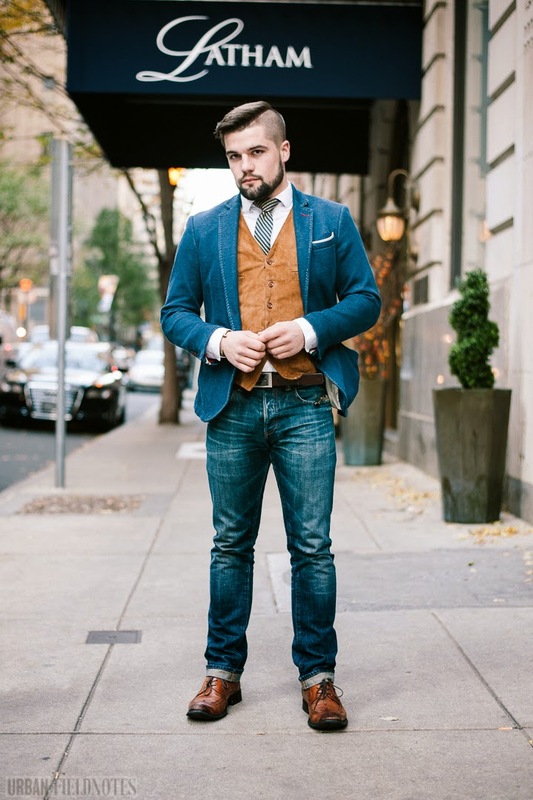 He's starting a blog called Elegant Men's Style, and is hoping to leverage it into a personal brand. Someday, he would like that brand to take material form, perhaps even as a menswear line of his own. Even dressing for Akief is a form of what my colleague at Temple Brooke Duffy calls "aspirational labour." Through clothes, he forges himself into an entrepreneur. This is what success looks like, his clothes seem to say. First comes the look of success, then reality rushes to catch up.